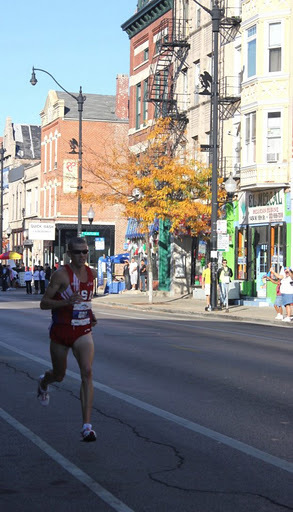 I met up with friends yesterday morning in Pilsen for the Chicago Marathon. I was glad to be a spectator again so watch all of the amazing runners. I was excited about seeing Ryan Hall!! Meeting time and place was at Nuevo Leon Restaurant at 7:30am (Mile 19). 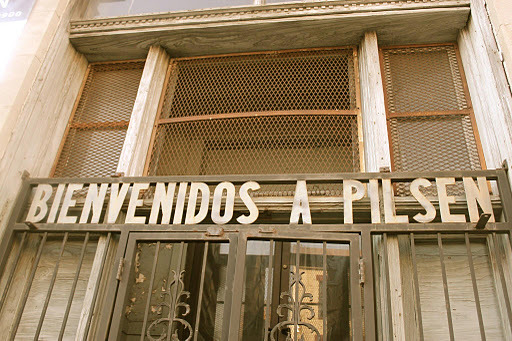 I got to Pilsen around 7 and parked my car about 2 blocks away from the restaurant. As usual I am the first one to get there and waited for my friends. Luckily I had a magazine to keep me occupied. I got bored waiting and got out of my car to walk a little bit. My friends were letting me know how far along they were and I finally met up with them outside McDonalds. We had to wait for another friend so we went into a coffee shop. By then the race had started and I was happily watching it on TV. we talked and talked and by then the leaders were halfway so that meant they were going to be at Mile 19 at about 30 minutes or so. We could hear the helicopters and the police sirens so that meant they were literally around the corner. So exciting!!! I was sad Ryan was not with the leaders. What happened? 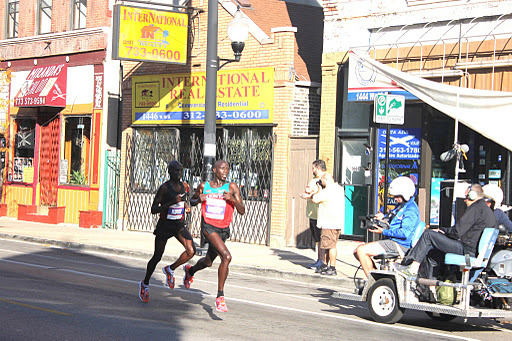 He was so confident about winning this year’s Chicago Marathon. Once the leaders passed my friends and I went to Nuevo Leon for some tasty Mexican food. If you are in Chicago you have to go there. The food is just delicious. had rice, beans, and enchiladas. I just realized I did not take a picture. I guess I was too busy eating. After we ate we went outside to wait for friends that were running in the race. I managed to see two friends in the race. I was so proud of them!!! As a runner myself I know what it is like to run 26.2 miles. It is time consuming, a commitment but also a rewarding experience. I am a firm believer that ANYONE can do it. Watching the runners was very exciting and motivating! However, I will confess that I am nervous. I don’t want to run another marathon close to 6 hours. I know, I know. I should be proud that I finished it and there is definitely nothing wrong with 6 hours. The Hartford Marathon will be by 4th marathon but I want to improve on my finish time. My PR was in 2010 with 5:40:49. A friend of mine ran the Denver Marathon in 4:53:59 and someone else I know ran her first (Chicago) in 4:51:56. I know I should not be comparing myself to them but I cannot help it. Last year I did better from 2008 (a PR of about 19 minutes). I remember that last year it was HOT and I struggled the last 7 miles. I have been monitoring the weather in Hartford and the forecast is 70s and sunny. Definitely not happy with that but I will take it. I am worried about the hills. I was told that there are hills but they’re not long nor steep. Enough rambling. I leave Friday morning so now it is time to relax, hydrate, and carbo load. My concern now is that since I am wearing compression capris, do I need to wear compression socks? Stick to the capris only. I think sock too would be overkill. GOOD LUCK!!!!! I totally understand how you feel about comparing yourself to others' times. 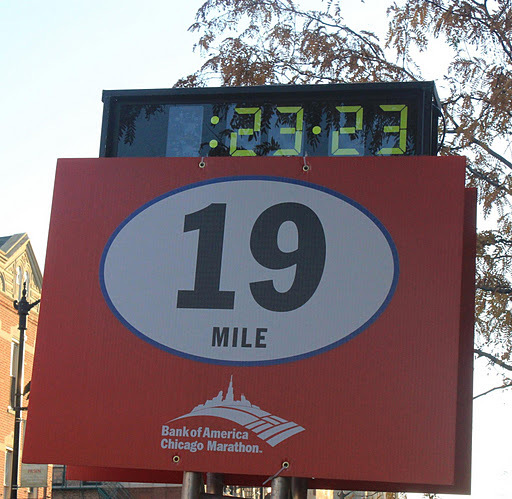 I was :10 seconds behind the cut-off time for the Chicago Marathon. I know I should be proud I finished, but I can't help to have wanted to do better! Good luck at the Hartford girl! Do your best..that's all you can do. It's tough to compare yourself to someone else or even your previous performance in a race of the same distance. So many x factors go in to training and the race. Hope this last taper week goes well. Must have been fun to watch the race. Your blog ticker says 2 days until the Hartford Marathon- run fast, have fun!